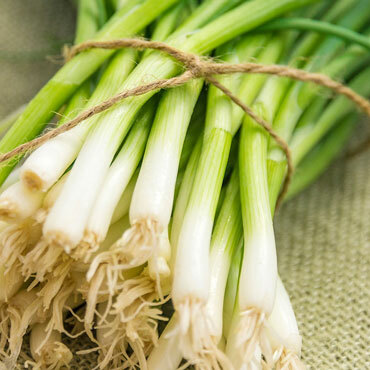 Bunching Evergreen White onions are a variety of delicious green onions that are cold hardy and disease resistant, with no sprays required to control pests or disease. You can sow a new crop of them two weeks! Evergreen Bunching overwinters in warmer climates, and its slim 12-14" stalks never form a bulb. They're tender, sweet and mild with long, white, clear flesh and mild, sweet necks. Enjoy as a garnish on top of baked potatoes or a veggie dip, or chop most of the way up the stem and add them to fresh salads of all kinds. They'll grow quickly, and are great for container gardening. 75 days to maturity. Soil Preference: Rich, well-drained sandy loam soil. ; pH 6.0 - 6.8.